At the edge of cosy Piesendorf, an authentic village in Pinzgau, only a few minutes by car from the famous Kaprun and Zell am See, lies the \"Bergbiberhaus\", with a view across the wide valley of the Salzach and the mountains of National Park Hohe Tauern. The right half (the only part you will occupy) of this characteristic, luxurious chalet has a living space of 174 sqm, stretching across three floors. The accommodation is ideal for friends or families who are traveling together, want to enjoy a fun holiday together, but also appreciate their privacy. This house combines authentic Austrian character with cosy, luxurious and durable living in every aspect, modernly and very comfortably decorated by local professionals with typical, qualitative materials. Out of ecological awareness, the house provides its own energy. On the ground floor, which is also suitable for wheelchair users, you will have a beautiful living room with an open-plan kitchen and direct access to the south terrace. The two-person bedroom has an en-suite bathroom which can also be used by wheelchair users. On the first floor, you can find the remaining bedrooms, among which a master bedroom, a bedroom with two bunk beds, and a special bedroom with a true sleep loft. In the basement, you'll find a luxurious private wellness with a sauna, an infra-red transmitter, an experience shower and a tranquility corner. You can reach the ski basement with heated ski boot-dryer, washing machine, and drying machine both from the outside as well as the inside. 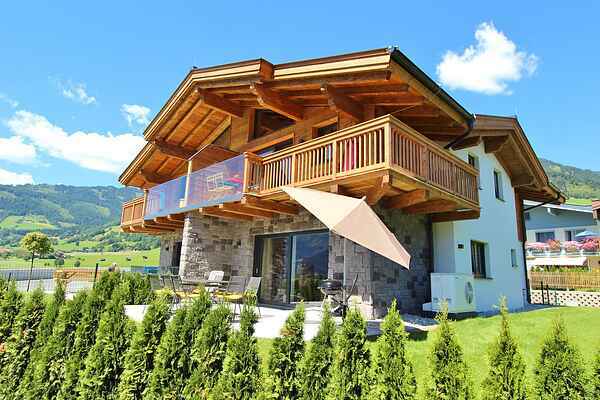 This chalet has the perfect location, on a sunny spot in the centre of Salzburgerland. A small train makes a stop near the chalet, and in winter it will bring you three stops further to the slopes of Zell am See for free. The glacier ski area of Kaprun can be reached by bus or car in only a few minutes. In the summer, the chalet is the ideal starting point for hiking trips in the Hohe Tauern, or for biking and mountain-biking tours. The chalet is within one minute of walking distance from the open-air swimming pool and lies at the Tauern Radweg, suitable for recreational cycling and hiking, also suitable for wheelchair users. A standard and a Nespresso coffee machine is provided. Capsules are available in local stores. If you prefer original Nespresso capsules, preferably bring them yourself.